This month’s meeting will be on Friday, September 7, at 8:00PM in room 215 of the Aerospace Engineering Building. This will be a “ball game” weekend, so parking could be a problem. We’re not sure if the parking lot behind the Aerospace building will be open or not. Plan “B” might be down Wright Street off West Magnolia. Our dark-sky star party this month, will be on the following Saturday, September 8, at Cliff Hill’s farm, clouds permitting of course. Ray Kunert and your editor took delivery of the AAS 12.5-inch from Tom McGowan on the Sunday following the August meeting. Ray is keeping the scope at his house until we have its latest “first light” debut. Ray is working on an inventory for the accessory case. Rhon Jenkins has donated two eyepieces for the scope: A 10mm wide view Plossl (2-inch University Optics) and a 32mm Konig (2-inch University Optics). Thanks Rhon! Tom was careful to preserve the integrity of all the scope’s components should we ever want to restore the scope to its original configuration. Tom’s craftsmanship is furniture quality. His workmanship reflects his attention to detail. He put in many hours of engineering the mount to best mate with the scope. Be sure to let Tom know how much we appreciate his time on this! It's not linked from anywhere on the "Loaner Scope" page yet, as we are not quite ready put it in “loaner” status. We’re still waiting to get the weights for the OTA and rocker box, and specifics on accessories. Let Rhon know if you want to be on the waiting list. The shirts no longer come in women’s sizes. They have a similar shirt that is white with navy strips. Since these shirts will fit women better, I have given the go-ahead with the ladies shirt that is just a little different. Hope that is OK. Sounds great. Vive la difference! Fall Regional Star Parties The Atlanta Astronomy Club presents the 14th Peach State Star Gaze, a week long event from October 7 through October 14. The PSSG will be held for the first time at the Deerlick Astronomy Village. Google Earth version 4 [4.2.0180.1134 (beta)] has a new icon at the top of the page – Saturn. Now you can explore the universe just like you’ve been exploring Earth. The navigation tools are the same. Lots of fun and its FREE! Google Sky demo with Dr. Sally Ride. Google has hidden a mini flight simulator within Google Earth. To access it for the first time, hit CTRL+Alt+A in Windows or Command+Option+A on the Mac. 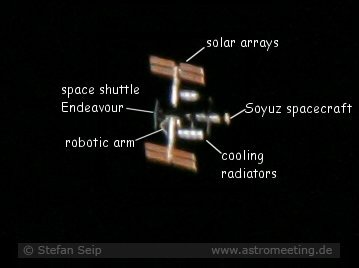 Earth-based Picture of ISS/Shuttle. 7 inch Mak, manually tracked, Canon 1D. You can have your own free astrophoto gallery at www.astrophotogallery.org .